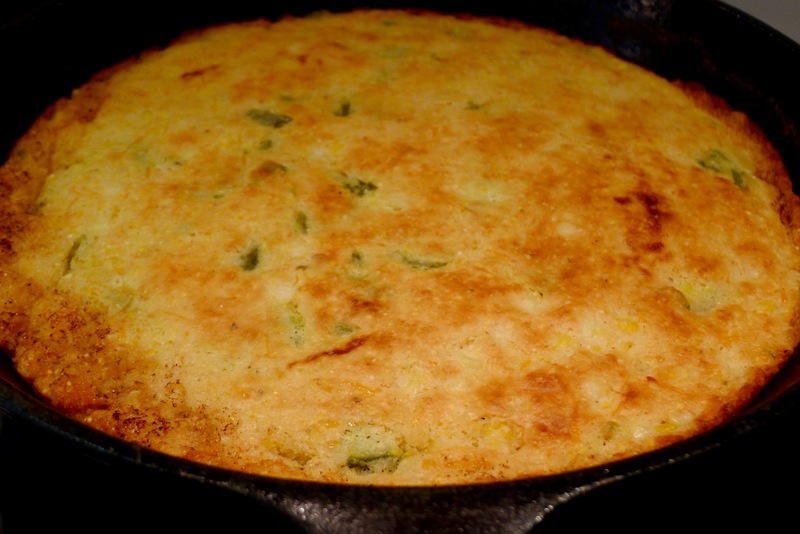 Hatch Green Chile & Cheese Cornbread | What's for Dinner? Posted on October 30, 2017 by What's For Dinner? The weather has FINALLY turned cool here in Texas and I’m loving it! When I heard that “Favorite Son” was coming home to visit for the day and bringing a friend, I decided the nice cool weather called for some good old comfort food! I love cooking on Sundays and having the whole family over. We call it Sunday Supper. I put on a big pot of beef stew and baked this Hatch Green Chile Cornbread. Both were outstanding, and I’ll post the stew soon. For now, here is the cornbread. It was moist, cheesy and had just a bit of heat from the chilis. Hope you enjoy it as much as we did! Preheat oven to 375°F. Place butter in a cast iron skillet and place in oven to melt. In a medium-sized bowl, mix the cornmeal, flour, salt, baking soda and baking powder. In a separate smaller bowl, whisk together the egg, sugar, oil and butter­milk. Add the wet ingredients to the dry and stir, just to combine. Do not overmix. Quickly stir in the cheese, corn and chiles. When the butter has melted and the pan is very hot, pour in batter…it should ­sizzle as it goes into the skillet. Immediately transfer it to the oven and bake until light brown around the edges, about 25 minutes. Cut in wedges and serve warm. howdy! Question: can the buttermilk be substituted?